In Brief: Spend seven days on the Silk Road, heading west to Kashgar and travelling by jeep instead of camel through the vast empty areas of Xinjiang Province. The Baicheng Landform, near Korla. Spend seven days on the Silk Road, heading west to Kashgar and travelling by jeep instead of camel through the vast empty areas of Xinjiang Province. Along the way, visit some of the sights in the less well known Silk Road stops like Korla, Subashi, and Aksu; finish the trip by exploring Kashgar! This trip is timed for the big October holiday. Book early – otherwise the flights might sell out before we can arrange your tickets! 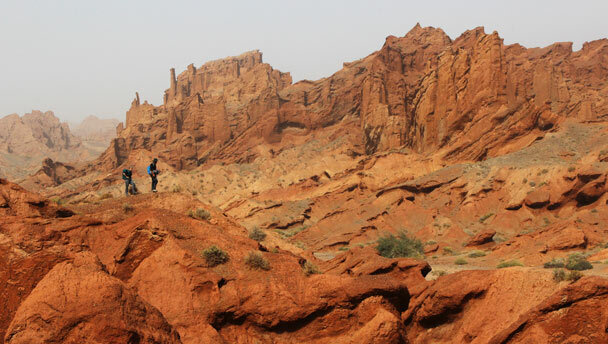 One of our most popular long distance trips is the ‘Journey from the West’, starting from Urumqi and heading east to Jiayuguan. On this trip we’re going the other way, following the Silk Road west to Kashgar – a journey of more than one thousand kilometers! Skirting the fringes of the huge Taklamakan Desert, we’ll pass through obscure Silk Road stops like Korla, Kuqa, and Aksu. We’ll take a hike to see the stunning scenery of the Baicheng Landform and the Dakziliya Grand Canyon, and will explore the Buddhist art and murals of the Kizil Thousand-Buddha Caves. Travelling by jeep will give us a good look at the lifestyle of those who live in the sparsely populated areas of western China, and we’ll get an idea of what it might have been like to travel the Silk Road in days gone by—in air-conditioned comfort, of course. Our jeep team is local to the area, and they’ve helped us pick out a few extra places to visit … places we wouldn’t have otherwise known about! The Journey to the West is one of the four classics of Chinese literature, and is a fictionalised account of the actual journey made by Buddhist monk Xuanzang in the sixth century. Some of the historical information known about the stops we make along the way is attributed to notes made by Xuanzang on his journey. Fly to Korla via Urumqi, tour Korla’s Old City. Drive to Kuqa, visit Old Town, Grand Mosque, King’s Palace. Ancient City of Subashi, Dakziliya Grand Canyon hiking, Baicheng Landform, camp overnight. Drive to Kashgar, evening walkabout. 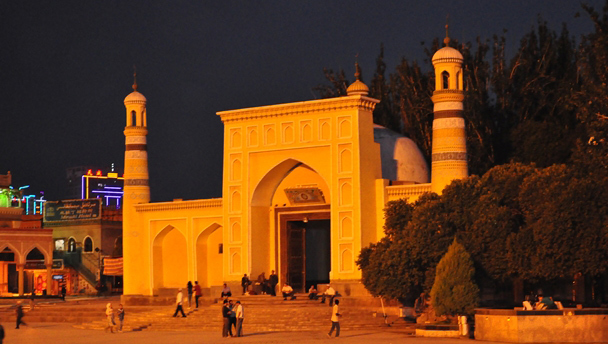 Tour Kashgar’s Old Town, Id Kar Mosque, Qing Dynasty concubine’s tomb, Grand Bazaar. Kashgar Livestock Market, fly back to Beijing via Urumqi. There has been a settlement at Korla since at least the Han Dynasty (206 BC–220 AD), when the town there was known as Weili and had a population of around 10,000 people. A river runs through Korla, and the river valley formed a natural passage between mountains and desert—no need for the Silk Road traders to cross the high mountain ranges nearby. One of the key fortifications in the area is the Tiemen (Iron Gate) Pass, a military checkpoint from the Tang Dynasty (618–907). The population has grown since the Han Dynasty, with a population of 470,000 recorded by the 2007 census. The majority of inhabitants are Han Chinese, and there's a substantial percentage of Uyhgurs, Mongolians, and Huis. Our jeep drivers come from Korla, and, for some of them, Mongolian is their first language. The economy has also changed in modern times, particularly with the discovery of oil in the Taklamakan Desert. Another key product of the area is the fragrant pear, which we're sure to get a taste of! In the book version of Journey from the West Xuanzang convinced a local river-ogre to become Buddhist, and to stop terrorizing villagers and travellers. In the actual journey, Xuanzang passed through carrying his copies of sutras. Kuqa was one of the Four Garrisons of Anxi, active during the Tang Dynasty. (The other three garrisons were Khotan, to the south, Kashgar, to the west, and Karashahr, north of Korla.) The garrisons were built during a time when the Tibetan Empire was vying with China for control of the area. Later, during the eighth century, Kucha became the center of the Uyghur Kingdom. Even further back, in ‘Antiquity’ (that is, before 476 or so), Kuqa was a Buddhist center, with notes made by Xuanzang of “100 convents, with 5,000 Buddhist disciples following doctrine and rules of discipline like those of India“. Kuchean music and dance was very popular during the Tang Dynasty, and we'll see depictions of lutes, drums, and dancing when we visit the Kizil Thousand Buddha Caves near Aksu. In Kuqa we'll visit the Old City, where we'll see the narrow lanes between mud-brick houses and perhaps the busy market in the Old City square, and we'll make visits to the King’s Palace, and the Mosque. Close by to Kuqa is the ruined city of Subashi, where we'll see the remains of a huge Buddhist temple. When Xuanzang passed through, he was so impressed he stayed for two months! The use of the site peaked between the sixth and eighth centuries, at which time it was home to more than 10,000. 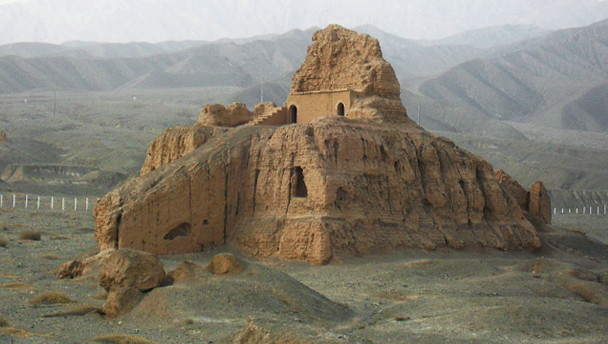 The temple was sacked during war in the ninth century, and never really recovered, especially as the influence of Islam grew in this area during the time of the Uyghur Kingdom. Not far from Subashi is an area with some excellent scenery. We'll set up camp at the Baicheng Landform, and will do some hiking there as well as in the Dakziliya ‘Grand Canyon’. 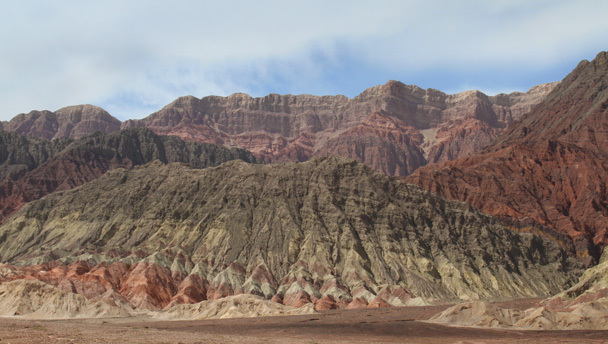 We'll set up camp near the weirdly-eroded Baicheng Landform, some of which is seen in the above photo. The Baicheng Landform is one of the special spots our jeep team told us about, and they know a good place to set up camp. They'll cook up dinner for us, and we'll enjoy a bonfire and some stargazing, weather permitting! In Uyghur, Aksu means ‘White Water’, and a big river nearby is likely the reason for this name. During the Han Dynasty, and until the early Tang Dynasty, it was known as Kumo, and described as a kingdom. It's sited at a fork in the Silk Road, with a section that crosses the mountains to get to the Ili River splitting from the main line of the northern Silk Road that skirts the top of the Tarim Basin. Nowadays, it's a fairly large town by Chinese standards, with a population of nearly 600,000. In Aksu Prefecture, there are nearly two million people, with 71% belonging to the Uyghur ethnic group. The economy is largely agricultural, with cotton, grain, fruits, oils, and beets the main products. Near Aksu are the Kizil Thousand Buddha Caves, a series of caves cut into rock high on a hill. The caves were carved by Buddists between the third and sixth centuries, and are the largest of their type in Xinjiang Province. The caves have a similar style to the Mogao Grottoes in Dunhuang, but were not as well hidden from the turmoil and treasure hunters through the years. Many of the murals remain, and three phases of influence on the artwork can be seen: Indian, Iranian, and Tang Dynasty. We'll take a closer look when we get there! As with seemingly all the Buddhist sites in the area, Xuanzang passed through, recording the presence of tens of Buddhist monasteries and noting that the customs of Aksu were similar to those of Kuqa, but that the spoken language was “somewhat different“. Kashgar is an ancient city in the far west of China, with many historically interesting sites and a strong Muslim influence from the large Uyghur community. 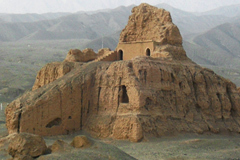 The earliest recorded mention of Kashgar can be found in Han Dynasty records that date back to 125 BC. At that point it was already one of the many stops on the Northern Silk Road, and, despite wars and battles, has been populated ever since. In Kashgar, we will visit many of the most interesting sights. Known as an excellent example of a traditional Islamic city, Kashgar’s Old City has undergone significant changes in recent times—some parts have been knocked down due to new regulations about building to meet earthquake and fire codes, and some sections are undergoing reconstruction. While the Old City might not be totally as aesthetically pleasing as it used to be, it’s still very much worth a visit just to get a look at the daily life of the local residents, and to sample a little bit of the naan bread sold at streetside stalls. The Id Kah Mosque, Kashgar. With a history that stretches back until at least the 14th century, the Id Kah Mosque is an active mosque and perhaps the largest in China. While we can’t enter during the times of prayer, we'll try to time it so we can get a look inside. Kashgar’s Grand Bazaar covers a huge area and sells a little of everything—carpets and silk, spices, dried fruit, animal skins and fur, hats, clothing, trumpets, drums, and other musical instruments, and much more! 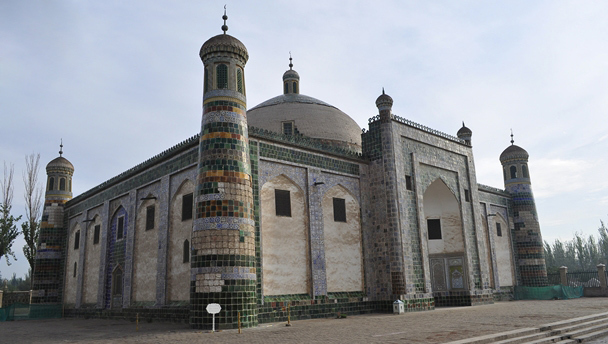 Commonly known as the Tomb of the Fragrant Concubine, it is more accurately described as the tomb of Afaq Khoja, a religious and political leader said to be a relative of Muhammad, and is one of the key Muslim sites in Xinjiang. The mausoleum was built around 1640 for Muhammed Yusuf, the father of Afaq Khoja, and is a domed structure with four corner minarets and a beautiful cladding of glazed tiles. The key points of the story of the Fragrant Concubine differ greatly, depending on which side is telling it. One side has it that her captivating scent caused her presentation as a gift to the Emperor, who she grew to love until her death. The other side has it that she was kidnapped, held against her will in the Forbidden City, where she plotted to kill him until she was murdered by the Empress Dowager. The livestock market is where local shepherds and farmers meet up to sell and trade livestock. We’ll visit for a look at this very interesting slice of local culture on the last day of the trip, and see if we can spot anyone using the secretive method of agreeing on a price. In October, the temperature is around 28°C during the day, and around 18°C at night. It’s unlikely that it will rain, but there is a small chance of encountering a sandstorm. Aside from the camping in the desert, we’ll stay in the best hotels we can find – 4-star (or the local equivalent) at least! You’ll be sharing a room at the hotel with another hiker. If you'd like a hotel room to yourself, it can be arranged at an extra cost of 1,325 RMB for the whole trip. We’ll flying to Korla and back from Kashgar, changing planes at Urumqi both times. For the rest of the trip, we’ll be in big, comfortable jeeps. The following food items feature prominently in the local cuisine: roast lamb, beef; naan bread; potatoes, tomatoes, green peppers. While in the cities and towns, we’ll take our meals at restaurants, and we’ll bring basic food to cook while on the road and camping. Some of the drives are rather long, and cross a lot of empty territory. Prepare some snacks for the drives; we’ll supplement them with nuts and biscuits and water. First, make a deposit of 5,000 RMB per person so we can be sure of getting your flight tickets during the peak holiday season. Pay the deposit before September 6 to qualify for the early-bird price. Please pay the balance before September 17. Afternoon flight back to Beijing via Urumqi (time TBC) All times are approximate, and depend on our speed of movement. A special report from our June 2016 Silk Road trip, with photos and commentary from hiking guide Abu, who is from Kashgar. Fresh photos from a seven-day expedition along the Silk Road, with stops in Korla, Kuqa, Aksu, and Kashgar. Fifty-plus photos from the Silk Road. Photos from a seven-day adventure along the Silk Road in Xinjiang Province. Photos from our maiden voyage along a lesser-travelled section of the Silk Road in Xinjiang Province.